As of Patch 4.1.5, you get your skill points spent in the Werewolf skill line refunded when curing yourself of Lycanthrophy. 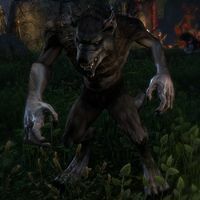 Any experience you previously gathered will remain, allowing you to become a werewolf again at a later point without any progression loss if you choose to cure yourself. As of Patch 4.1.5, the ability bar can be rearranged without being in werewolf form. This page was last modified on 22 April 2019, at 11:41.